Over 950 men from the City of Middletown (from an 1860 population of 8620) would eventually serve their country during the Civil War. While each came to the decision for his own reason, once a soldier, their lives became intimately tied to their company and regiment. Formed on a regional level, platoons and the larger company would often have members of the same family, neighbors, and life long friends among their ranks. The men trained, fought, and died alongside members of their community. This method of recruitment was particularly devastating as a community’s entire generation of young men could be wiped out in a single engagement. While a draft was instituted in 1862, only 20% of the federal fighting force would be supplied this way. The majority of soldiers volunteered for a three-year term willingly. Rival recruitment offices opened in Middletown and competed for able bodied men between the ages of twenty and forty-five. 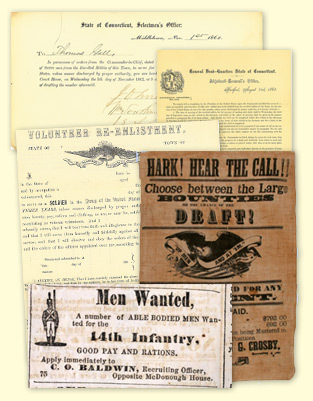 Bounties were offered by the city to fill enrollment requirements and were advertised on broadsides, in the newspaper, and even on flour sacks. 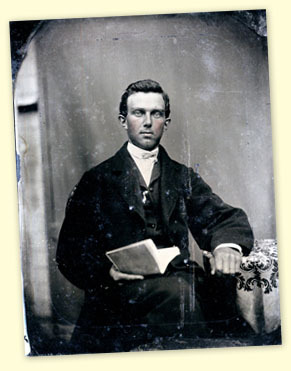 Dwight Pierce (1846-after 1913) was born in Chatham (now East Hampton) and upon reaching his majority found work as a schoolteacher in East Lyme. He joined the army in 1863 and served until 1865 in Company A, 1st Regiment Connecticut Volunteers. A man fond of words, he carried a small diary with him in 1864, recording his experiences. In 1868 he expanded this diary into a war memoir, and then in 1915 wrote his autobiography. While the 1868 memoir was written three years after the completion of his service, it still reflects very clearly the experiences of a young private in the service. On weapons: Then I received a musket, yes, a nice Springfield Rifle, brand new. Good to use at long range – if you happened to hit just right – if you did, it was all on account of good luck, for they never could be relied upon as being accurate in the hands of a green Marksman. 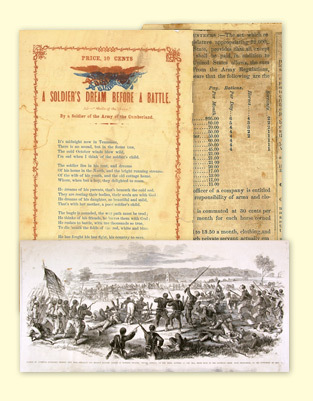 While the war between the North and South was partially about abolishing the peculiar institution of slavery, African-Americans were not allowed to join the fighting until after July 1862. The federal government did not begin official enrollment until after the issuance of the Emancipation Proclamation in January 1863, but individual states began recruiting earlier. 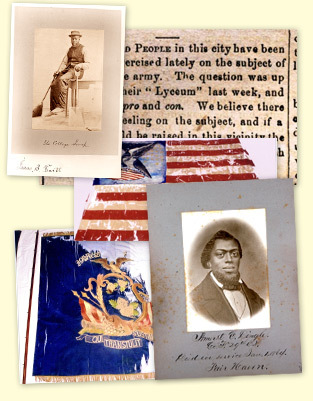 The ranks of the 29th Regiment and the 30th Regiment Connecticut Volunteers were comprised of so-called “colored” troops. A private in these regiments would receive a lower bounty and less pay than white troops, face a 35% higher mortality rate, and be disproportionately assigned menial work such as building battlements and burying the dead. When allowed to fight, African-American soldiers proved their worth and quite often fought harder than white troops as capture would often lead to a firing squad or slavery behind the Southern lines. While Middletown’s African-American population was a modest one, 173 people or 2% of the population, it was well represented in the colored troops. Twenty men from the community chose to serve their country. Due to the widespread prejudice of white soldiers and officers and the belief that African-Americans would not be able to fight effectively, they were not allowed to lead their own men into battle. African-Americans were not allowed to hold any rank above 1st Sergeant although they would eventually be allowed the rank of surgeon and chaplin. Led by white officers into battle, African-American troops proved their courage at such battles as the Skirmish at Island Mound, the Battle of Port Hudson, and the assault on Fort Wagner which was immortalized in the movie Glory. Nathaniel Hubbard (1842-?) of Middletown joined the 21st Regiment as a private, but took a position with Company B 6th United States Colored Infantry in order to receive a promotion to 1st Lieutenant. He was wounded at Newmarket Heights, Virginia on September 29, 1864, and resigned his commission in March 1865. Joseph K.F. Mansfield was born in New Haven, Connecticut, December 22, 1803. His mother, Mary, was a Middletown native and thus he visited his grandparents in Middletown frequently as a child. Entering West Point at the age of fourteen, he graduated second in his class in 1822. He served in the Corps of Engineers throughout the Mexican War (1846-1848), receiving numerous promotions for gallantry and efficiency. In 1853 he was appointed Inspector General of the Army and with the start of the Civil War was promoted to Brigadier General in 1861. On September 17, 1862 at the Battle of Antietam while leading two divisions into the fray, Mansfield mistook an advance group of the 20th Georgia Regiment for Union forces and ordered a cease fire. John M. Gould of the 10th Maine wrote the following to Mansfield’s widow in December 1862. The General had been shot by a sniper’s minie ball, which passed through the right lung and back out again. Mansfield lingered for a day before dying of his wounds and was one of over 3,600 causalities from the battle. General Mansfield’s body was returned to Middletown where he was buried in the Indian Hill Cemetery with full civil and military honors. Mansfield was much beloved by the men with whom he had served. 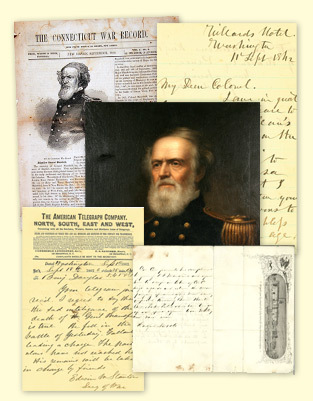 Numerous letters were written to his widow, detailing his final moments or sharing some tale of common exploits. George Meech, a private in Company C 21st Regiment Connecticut Volunteers, collected a stone, supposedly from the spot where General Mansfield fell. This stone is on display at the General Mansfield House. The officers of a regiment were in the position of holding the fighting unit together. Frequently they had been with the men since the beginning, had enlisted them to begin with, were men that they had worked or worshiped with in their hometown. Volunteer units in the Civil War were allowed to elect their own non-commissioned officers and these were typically men of standing in the community from which the company hailed. Elijah Gibbons (1831-1862) was born in New York City but spent the majority of his life in Middletown. He worked at the W & B Douglas Company and eventually worked his way up to foreman. Gibbons viewed Benjamin Douglas as a mentor and the two men both held strong abolitionist beliefs. Gibbons’ beliefs were so strong that on December 2, 1859, he rang the bells of the 1st Baptist Church, where he was sexton, to mark the execution of John Brown. This cost him the right to ring the bells and almost resulted in his expulsion from the congregation. 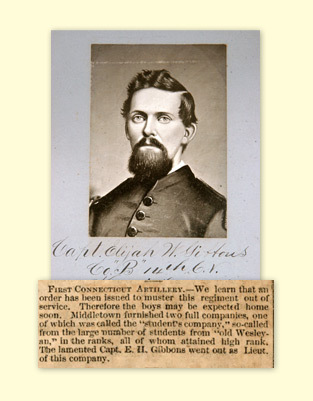 Gibbons joined the state militia as a 1st lieutenant in 1856 and once the war began was instrumental in recruiting and training the members of the Wesleyan Guard, which would become Company G 4th Regiment Connecticut Volunteers and had the honor of being the first three year enlistment regiment in the state. He served with Company G, 1st Regiment Connecticut Volunteers Heavy Artillery as a 1st Lieutenant and later as a Captain of Company B, 14th Regiment Connecticut Volunteers Infantry. Gibbons was responsible for recruiting the 100 men who would form Company B. His recruiting office was over Chaffre & Camp’s Store on Main Street. John Broatch had helped to secure the commission for Gibbons by pleading his case before Governor Buckingham and served as his recruiting officer. Levi Jewett served as the examining surgeon who was responsible for certifying that recruits were physically fit for army life. The 14th Regiment took heavy losses at the Battle of Fredricksburg. One hundred eighteen men were killed, wounded or went missing between December 11-15, 1862. Captain Gibbons’ left thigh was shattered by a bullet on December 13 and he died on December 19. His widow, left with two sons under the age of five, did not have the financial resources to bring his body home. His former co-workers at the Douglas pump factory and his mentor Benjamin Douglas, collected the necessary funds. John Douglas, Benjamin’s son, retrieved Gibbon’s body and brought him home for burial in Mortimer Cemetery. The friends and comrades of Elijah Gibbons honored his memory by naming one of Connecticut’s first Grand Army of the Republic posts in his memory; G.A.R. Post No. 6 formed on March 29, 1867. John C. Broatch (1843-1904) was born in Middletown and worked as a machinist until the outbreak of the war. Originally a member of the Mansfield Guards, his regiment was present at the first battle of Bull Run. Re-enlisting in the 14th Regiment Connecticut Volunteers, he rose from private through the ranks of lieutenant colonel, colonel, returning with the brevetted rank of major. 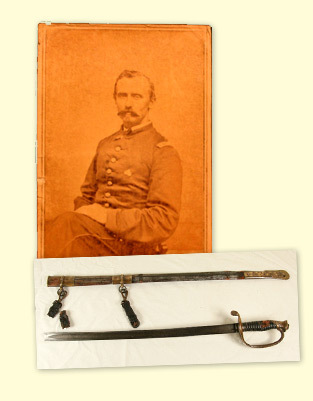 This sword was carried by Broatch during the Battle of Morton’s Ford. On February 6 & 7, 1864, the Union troops forced several crossings of the Rapidan River to distract the Confederate troops from a raid up to Richmond, Virginia. Levi Jewett (1835-between 1901 & 1910) was born in Griswold, and while an instructor at Bacon Academy in Colchester, studied to be a medical doctor. Receiving a commission as an assistant surgeon in the 14th Regiment Connecticut Volunteers, he served with the regiment as they moved through the war and the battlefields of Antietam, Fredericksburg, Chancellorsville, Gettysburg, Morton’s Ford, and the Wilderness before being wounded at the second Battle of Ream’s Station on August 25, 1864. 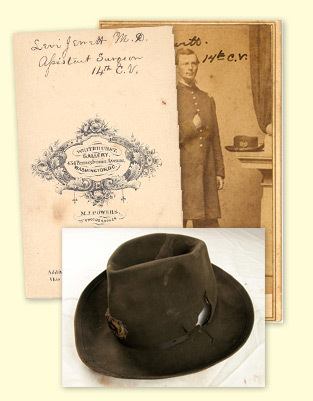 A fragment from a shell passed through his hat before seriously injuring his eye. He served out his term of service in hospital duty in Baltimore and eventually retired with his wife to Middle Haddam. Dr. Jewett was an active member of the Mansfield Post, Grand Army of the Republic in Middletown. He donated the hat he was wearing that fateful day to the War Relicts Collection at the Russell Memorial Library. This collection forms the basis of the collection at the Society and continues to be a testimony to the men who fought and to the others who worked so hard to preserve artifacts and memories of those momentous events. The life of an enlisted soldier was not an easy one. Memoirs of the war speak of endless waiting, marching to and fro in the heat and dust, and the terrors of engaging with the enemy. The common soldier, upon being mustered in, would typically receive a wool coat and trousers, underclothing, a kepi (a hat based on a French cap), a knapsack, haversack, cartridge box with belt, cap pouch, canteen, rubber blanket, and wool blanket. Soldiers did bring items from home, but anything a soldier had would need to be carried on several days worth of marches that were many miles long. Railroads and boats were used to move troops when feasible, but often it was a soldier’s feet that carried him to battle. The pay of a private was only $13.00 a month and was often late or sent to the last place the regiment had been, not necessarily where they currently were. Food supplies were intermittent in the field, with soldiers being issued rations consisting primarily of hardtack (a biscuit made of flour and salt with no fat or leavening agent) and salt pork as these could be carried for days with minimal fear of spoilage. The items here were all carried by Cornwall during the war. Letter courtesy of Dennis A. Buttacavoli. An enlisted soldier had to carry everything he might possibly need on his back. Haversacks were used to carry rations and eating utensils while knapsacks were for extra clothing and personal items. 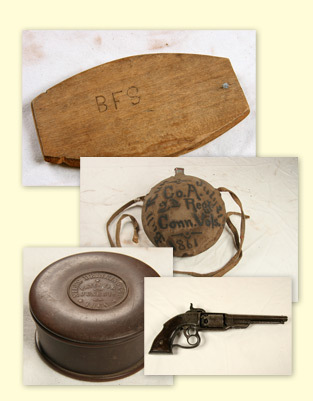 The knapsack was carried by Henry C. Hill a Corporal in Company B, 10th Regiment Connecticut Volunteers Infantry. The canteen was indispensable for hydration on long marches and the telescopic drinking cup, patented in 1860 would have added a touch of civilization to a meal by the camp fire. The grater, made from a tin can by a soldier in the 14th Regiment Connecticut Volunteers, would have enabled a soldier to grate their hardtack in order to mix it with a fat or water to make it more palatable. 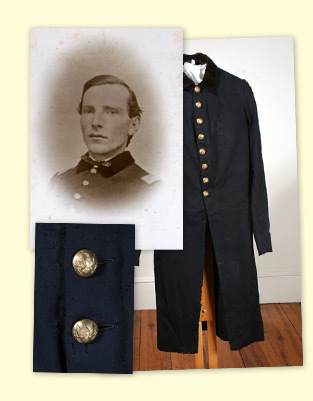 This sack coat was worn by Henry Rose of Company L, 1st Regiment Connecticut Volunteers Heavy Artillery and the traveling mirror was carried by B. Frank Sage of Company D, 20th Regiment Connecticut Volunteers Infantry for three very long years. Most telling of all is the wear on the revolver of Charles Pelton (1839-1930) who was with Company A, 2nd Regiment Connecticut Volunteers Infantry. Pelton only served for three months but they must have been hard ones. “The absent are not missed. The living are wonderfully reckless.” The Connecticut War Record on the Siege of Port Hudson. 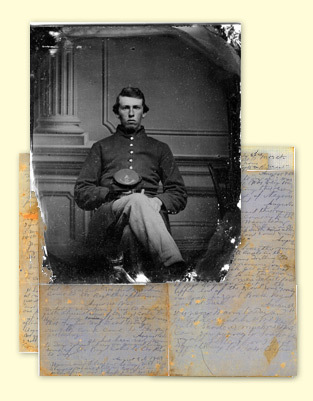 Charles Osborne (1841-1910) of Middletown joined Company A 24th Regiment Connecticut Volunteers as a private in 1862. In 1863 the Union Army surrounded the town of Port Hudson on the Mississippi River in Louisiana. The two armies had been fighting for control of the river throughout the war and the Siege of Port Hudson from May 21 to July 9, 1863, would prove crucial. The fighting was fierce and interspersed with both sides attempting to wait each other out. Food and ammunition supplies on both sides ran low, and thousands of men would die of wounds or disease before the Confederates surrendered to the Union forces. While the journal does not go into how the experience of the siege affected him, one only need look at the images of Osborne before his enlistment and afterwards to garner some idea. Throughout history, soldiers have always removed things that did not belong to them from battlefields. From the full-fledged looting of a city to the collection of souvenirs to bring home, booty has always been part of the military experience. This daguerreotype was collected by Curtiss Arnold of Colchester from a Confederate body during the Siege of Port Hudson. 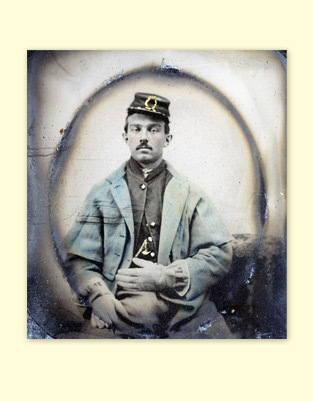 Numerous battlefield accounts speak of men dying with an image of their loved ones in view. When a man realized that he wasn’t going to die in his own bed, surrounded by those he loved, he took comfort where he could. What a long trip this little image of home has taken. 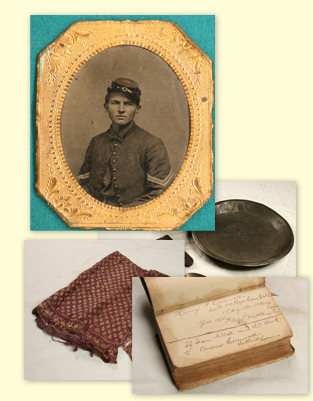 The piece of rebel homespun, possibly a pocket, was “cut from the coat of a dead rebel at ANTIETAM” according to its original label. 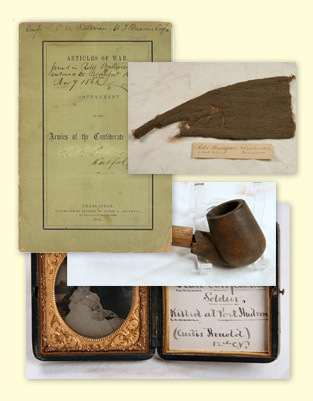 The small, well-worn pipe was picked up in the deserted camp of the 16th Mississippi Regiment between Richmond and Petersburg, Virginia as stated on an old label. What about these items caught a soldier’s eye and not only made him pick them up and bring them home, but then preserve them for years and later donate them to a public institution? “Surely our mourning was turned into joy and we could praise God from whom all blessings flowed, and thank Him for delivering into our hands those things for which we had wished.” Dwight Pierce on the cessation of hostilities. “One fine evening at a quarter past three, as the infantry were passing out to relieve the pickets on our lines the rebel battery opened on one man with sharp canister shot and percussion shell, from a half dozen rifle and smooth bore guns, in the new rebel fort.